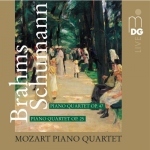 CD "Schumann / Brahms: Piano Quartets"
new release on Soundcloud : a historical live - recording of Lutoslawski's cello concerto under the baton of the composer. The exquisite swiss label Divox relaunched recordings with exceptional cello repertoir from the 90ties with cellist Peter Hörr. Sonatas by Uwe Gustav Jenner, H. von Herzogenberg and Franz Xaver Mozart as well as great repertoir by Brahms and Schumann are now also available on itunes. 10.-19.8.2012, Mozart Piano Quartet: Paul Rivinius, piano, Mark Gothoni, violin (Universität der Künste Berlin), Hartmut Rohde, viola (Universität der Künste Berlin, Royal Academy of Music London), Peter Hörr, cello (Hochschule für Musik and Theater Leipzig). Pianist Salla Karakorpi and pianist Robert Roozeman. Course fee: 100-250 € (lessons). Only Chamber Music: The members of existing ensemble 100 €, others 150 €. Piano, Violin, Viola & Cello Master Classes: 250 € (including Chamber Music).